Apple has removed the last fully-functioning Bitcoin wallet app from its app store, blocking iOS device users from popular apps available on Android. Blockchain had been available from the iPhone-maker's App Store for over two years prior to its removal on Wednesday, February 5. In that time, it had clocked up over 120,000 downloads and wasn't the subject of any complaint made by users to Apple. Citing an "unresolved issue," Apple has removed it from the App Store, meaning users of iOS devices (with the exception of jailbroken devices) are unable now to download any fully functioning Bitcoin wallet app for their devices. Blockchain has responded angrily to Apple's decision to remove the app without providing any prior warning, any reasonable justification for the action or any means of redress. "These actions by Apple once again demonstrate the anti-competitive and capricious nature of the App Store policies that are clearly focused on preserving Apple's monopoly on payments rather than based on any consideration of the needs and desires of their users," reads Blockchain's scathing reaction. It notes that Google's Play Store provides a large number of fully functioning Bitcoin apps despite those apps providing competing services to Google's own "Google Wallet" service. Over the past couple of years, Apple has either removed Bitcoin apps from its store outright, or forced developers to make considerable functionality adjustments to keep them online. In May 2012, Apple culled the BitPak app from its Store, informing the developer of concerns about the legality of Bitcoin across jurisdictions that the BitPak app was available in. In November 2013, it removed the Coinbase app from its store after just one month of availability. 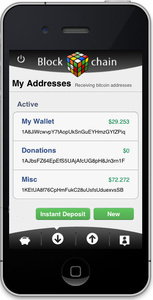 A month later again, Apple told the developers of Gliph to remove the ability to send Bitcoin using the app. Gliph released an updated app which still allowed users to create wallets, view balances and receive bitcoin in the Gliph app. At the time, it informed users that they can still send Bitcoin through a mobile browser, like Safari. Blockchain isn't the first Bitcoin app culled in 2014 either; In January, Apple targeted Australian Bitcoin app CoinJar for iPhone. Apple gave the developer the opportunity to remove the ability to carry out Bitcoin transactions and keep the more limited app on the service, citing regulation and legal concerns. CoinJar opted to remove the app altogether but stressed a preference to work with Apple again in the future when regulatory issues are more clear. With Bitcoin's growing popularity, Apple should not so easily snub the crypocurrency or its growing userbase, particularly as its major mobile OS rival Android is not doing the same. After all, isn't Apple the company that was founded on principles of disruptive technology, of shaking up the tech and business world even when it makes the established players uncomfortable? No, Apple is the company founded on making money by any means even if illegal. Their first product was a device to steal long distance from the phone company. I'm amazed they had a bitcoin app at all; shouldn't that have been weeded out on the basis that Apple had no immediate way to make money on it? Definitely not surprised and glad Google gives us a much improved option.